It had been stored in a van and was generally grimey and smelled like an old basement. The tires were trash and I didn't even want to imagine what was the liquid that half filled the water bottle. Somewhat surprisingly, the gears all worked very nicely and were adjusted correctly. The brakes even worked. But, alas, I don't know if was the seriously Miami Vice color scheme, the shear brilliance of the "SIS" Shimano 5 speed indexed rear freewheel or what, but I decided this bike needed a quick and simple facelift and then to be drafted into a fun bike for short trips....maybe one to keep at the office for errands or lunchtime riding. I replaced the seat and post with a spare Turbo saddle and a nicer post I had in my workshop. 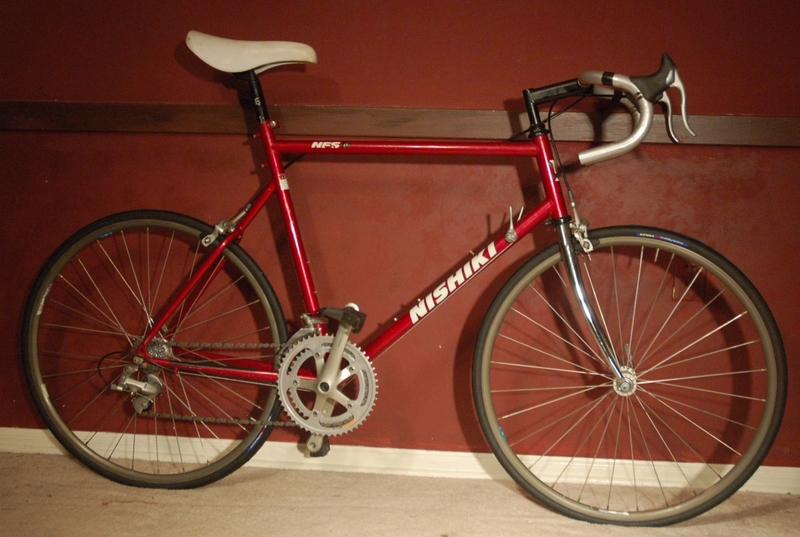 I replaced the heavy steel drop bars and levers with a slightly chopped riser bar and some old mountain bike brake levers that were on a set of bars I was already harvesting grip shifters for another bike from. Keeping with the theme of total recycling, I used best used cables and housings I had laying around for the brake setup. I'm not sure where the grips came from, but they were in the workshop too. The rack came off and was hung on a hook. 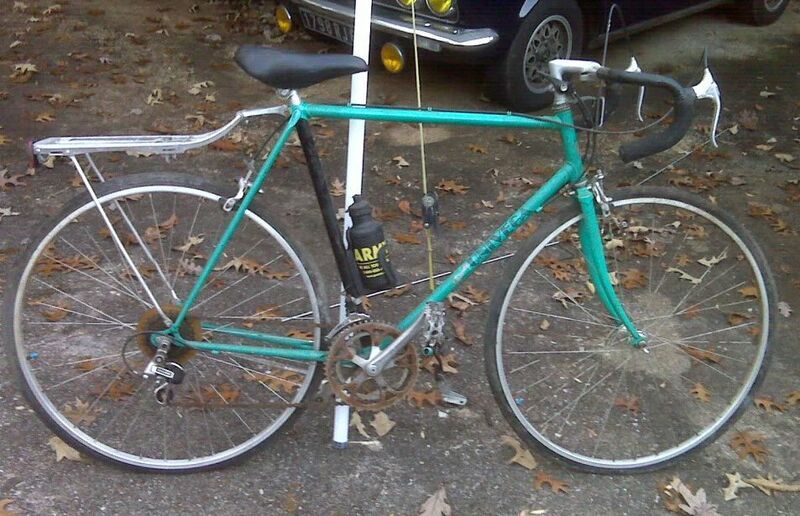 I believe I know just the right Robin Hood 3-speed bike that could use the rack as long as it cleans up nicely. I replaced the brake calipers with a set of black Universal single pivot calipers that were original to my mid-late 80s Bertoni Nouvitalia. The wheels were true and the bearings felt good, but there was rust on about a third of the spokes. Again, in keeping with the theme for this bike, aluminum engine spray paint came in quite handy after a quick scuff-down with some 100 grit sandpaper on the spokes. I wouldn't recommend this for anything but a project like this, but then again painting the aluminum silver on the old wheels does give me some sort of inner anti bike snobbery pleasure. For proper bicycle karma and inner balance, I used new tires and tubes (some sort of self-sealing or puncture proof tubes I had bought for another project a long time ago, no less!). So, with all that description, here is the final product. I haven't had a chance to put many miles on this bike yet, but I have to say it's just fun to ride. I don't know if it's the position, the luck of a perfect fit or what, but it just puts a smile on my face...and kinda makes me want to pop a wheelie or something! 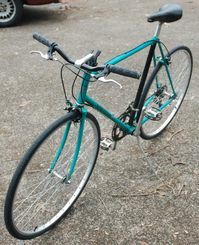 And, for the sake of providing some halfway decent photo documentation, here are some detail shots of the bike. Oh, by the way, the steel chainrings still have a residue from the rust jelly i used on them...so, there's a bit more sanding and detailing to do. 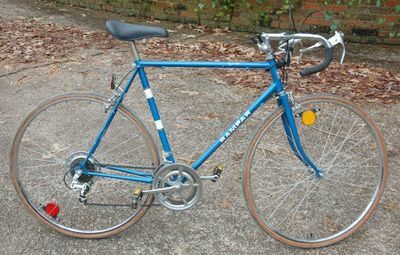 I do not know the model name or the year of this bike. If anyone knows what it was called, what may be missing from the decals, or the year, I'd love to hear from you! if nothing else on this site is indication enough, here is tangible proof that the bike museum does not practice bike snobbery. This is a nearly all original, pretty decent condition Rampar Rapide 10-speed road bike. 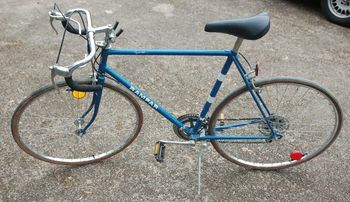 Apparently Rampar was a division or Raleigh bicycles and this bike probably comes from the late 70s-early 80s. The frame and paint are nearly perfect and other than some random rusting on a couple spokes, some of the typical grime on the drivetrain, deteriorated bar foam and old, discolored tires I'd say it's probably in better shape than a lot of bikes people are out riding. As you would guess, it has 27" wheels. The derailleurs are Suntour, with a front derailleur that works the opposite of most...in other words, the 'rest' position for the cable is at the large chainring. 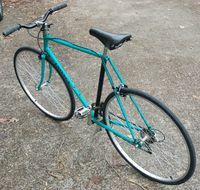 The rims and handlebar are chromed steel, so it's not a lightweight bike. The construction of the frame is nice, and clean with the typical classic lugwork you would expect to see from a bike from that era. With a nod to the recognition that you can't have it all, the Rampar is currently for sale on the local Craigslist. I hope it will find an owner who will use it and enjoy it. 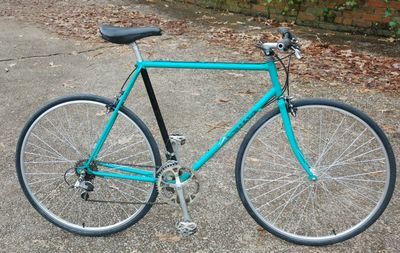 This bike could make an excellent, sturdy, almost theft-proof urban commuter or be simply transformed into a clean single speed or fixed gear machine with the addition of new wheels and shedding some weight elsewhere on the bike. Since I didn't find a lot about these bikes on the 'net, I figured I could do a modest service to other bike enthusiasts by providing some photo documentation of what these bikes look like in what is apparently their original form. Hope you enjoy them! 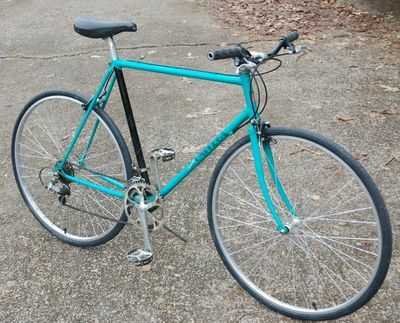 UPDATE: This lovely time capsule of 10 speed splendor was sold to a gentleman from Texas very shortly after it was added to the museum. I'd love to hear from him and see how the Rampar has turned out. For now, it's just nice to know it's gone somewhere where it can be appreciated.